According to the ABC... "The Western Australian Cricket Association (WACA) has denied reports that Pakistani batsman Younis Khan will play for the Warriors next season." Apparently he's been cleared by the Pakistan Cricket Board to play, but the WACA are denying all knowledge. Sure it would be kind of cool to have an overseas player, but I can't imagine we're short of players talented enough to make the team? There's always Oomby Dave, who, only this week, took five wickets in one over and made 25 runs. Well done Oomby Dave. Ricky Ponting owned the West Indies in the first Test match in Jamaica. To this I say... yaaaay!!! He scored 158, which is nothing to be sniffed at, even if you are the leader of the Liberals in WA. At the end of Day 1 we're 4 for 301. 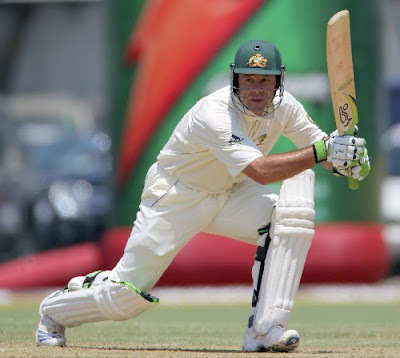 And I'm sure all Victorians will be thrilled with Brad Hodge's decent 53 off 105, which makes Michael Hussey's 56 off 146 look disappointing, and he (Hodgey) is still in. Amazing. So it's all looking good. Shame really, because I just heard on news that Michael Clarke is on his way out there to join the team. 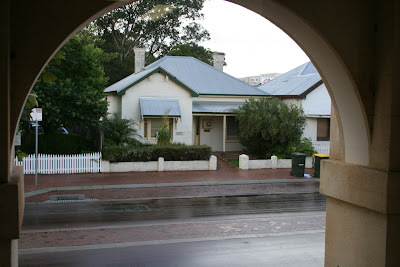 As you can see by the above photograph, it's a rather rainy day in sunny Perth today. Although, this photo doesn't depict it very well because it stopped raining when I took the photograph and the sun came out. Even so, I wish I was in Jamaica. I will go to a Test match in the West Indies in my lifetime. After all, we need to him to lead us to another five-nil whitewash next year, which is something I look forward to more every day. He's stylish, he's talented, he's everything we need and so much more. My heart goes for the Windies bowlers, considering what awaits them over the next weeks. Lambs led to the slaughterhouse. I sincerely urge all to come forward and form a People for Ethical Treatment of the Windies Bowlers. A very valid point you make. But if everyone ran away at the prospect of being slaughtered by the Aussies, well, who would we play?! The World XI sucked! Ponting & Co maybe a square-cut above the rest but they are not the Invincibles! And none running away from Tricky Ponting's men, ok? I was just feeling for the Windies bowlers, easy meat for the Aussies. So are the Poms, anyway. But that aura of invincibility has been punctured and I don't see any halo around Punter's head either. Stylish my Arse! He's a hobbit with someone elses hair..
Useless skipper when the chips are down, which they will be next year! Yes, the aura of invincibility has definitely been punctured, but I imagine they'll just keep chipping away, after all, we've got some Ashes to retain. I think Punter's new hair is covering his halo. I suppose that was you, Q? Suave, I happen to like hobbits. I think i said it wud be in the 2nd test. So lets c if this wud be his only big score or whether's Ponting's back for good.